We are excited about this one! (Is there ever a project we aren’t excited about?!). A friendly and easy going family with high style and a love fresh finishes, it doesn’t get better than that. This new construction project is underway and we are highlighting the design of the kitchen. We are excited to see Jarom and his talented team at Alair homes implement the design. Alair’s clients have so many great things to say about the knowledge, talent, and integrity of the Alair team. And we couldn’t agree more. We started with space planning each room and making several changes to the floor plan to make it work best for the client. 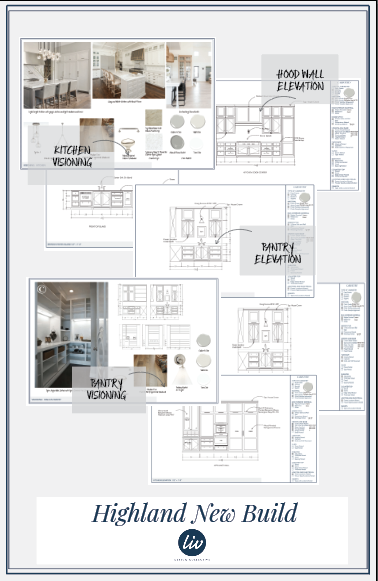 Next we created visioning boards for each space to give us design direction to make selections easier. The entire house was envisioned first and that made plugging in colors, materials, and finishes move faster. Of course, we designed custom detailing in the cabinetry and even noted all of the countertop and hardware details. Two of my favorite features in this kitchen are the art with light overhead in the pantry and the contrasting cabinet similar to the image above we used in the visioning. Can’t wait to see these details come to life over the next couple of months!